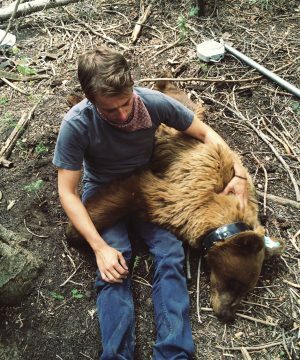 Living his childhood dream, one grad student is working to help bears and humans peacefully coexist. Now @grizkid, as he’s known on Instagram, where his adventures are followed by more than 65,000 people, is getting up close and personal with Mother Nature in an unforgettable way—working as a researcher and bear biologist under wildlife and wildlands professor Thomas S. Smith (BS ’82, PhD ’92). Smith, who has studied bears for more than two decades, and his team of students are conducting research in hopes of decreasing the conflict between human and bear populations. Wesley Larson's adventures have caught the eye of National Geographic and 65,000 Instagram followers. Courtesy Wesley Larson. In one early trip to northern Alaska, the researchers located a den and planned to leave cameras to catch any bear activity in their absence. “I had traveled 15 miles on my snowmobile, and I’d set up my camera, and a mother polar bear popped out and was just watching us as we were doing our thing,” he remembers. Larson’s had his share of the heat on other adventures, studying Bryce Canyon’s black-bear population. On a recent trip, he was accompanied by National Geographic photographer Corey Arnold, who, on the magazine’s Instagram account, called a foray behind Larson into a 70-foot bear den “one of the most claustrophobic and scary situations of my life.” For the most part, sedating and collaring the bears with GPS trackers doesn’t faze Larson: he’s motivated by the hope that keeping tabs on the bears will help the park know how to better prevent human contact. Out of 80 cybersecurity-competition participants, seven were women—and four of those ladies were from BYU. You’ve heard about BYU’s national-champion men’s rugby team. Now the women are taking the national spotlight.